Two days filled with creativity have pushed me out the comfort zone and they have made me re-evaluate my tools and strategy when approaching the learning process. Within a group filled with passion and enthusiasm for this awesome profession we have influenced each other and came up with ideas, skills, and ways that shaped into awesome products through creativity driven processes. Anne-Marie Evans is responsible for putting up this great concept of a workshop that pulls the best out of you. Thanks for the inspiration, Anne-Marie! Some interesting concepts were completely new for me and they are getting a well deserved attention in my planning and day to day activity. The students response was nothing but enthusiastic when I started to apply some of the ideas taken from this workshop. Interested already? Read more about it here: http://tinkering.exploratorium.edu/. Tinkering typically blends the high and low tech tools of science along with a strong aesthetic dimension that supports children’s and adults self expression. Convergent Thinking. It Is the process of finding a single best solution to a problem that you are trying to solve. It is about judging options and making decisions. A convergent thinker is logical, objective, intellectual, realistic, planned, structured, and quantitative. Divergent Thinking. It is the process of generating many unique solutions in order to solve a problem. The divergent thinker is intuitive, subjective, emotional, imaginative, impulsive, holistic, free-wheeling, and qualitative. You come with ideas for the project and how you can put the project together. Develop prototype, test it, refine it, and hone it. You reflect on what you have done. Constructivism. It is described by Piaget as being the process whereby students constructed their own unique systems of knowing. The teacher should focus on this individual process of internal construction rather than standing at the front and spouting their own models. The learner is and information constructor. The information is linked to the prior knowledge, thus mental representations are subjective. The learner brings past experiences and cultural factors to a situation. Constructionism. It is seen as a social process whereby constructs emerge from ongoing conversations and interactions. Zone of Proximal Development. 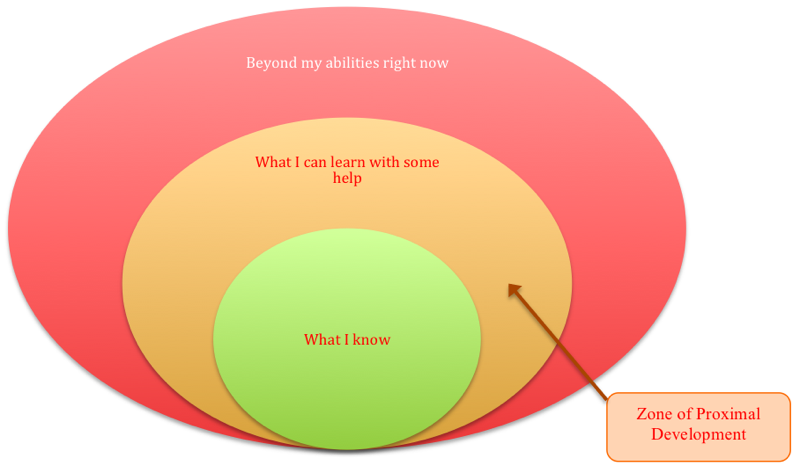 It is the difference between what a learner can do without help and what he or she can do with help. It is important how we can assist best that child in mastering more advanced skills and concepts. I went back to my students and we have experienced various form of tinkering when inquiring into basic movement skills during the Individual Pursuits stand-alone unit. The outcomes quickly amazed me with an increased potential of creativity shown by our students. How is your classroom creative? That was the starting point of this workshop and this is one of the questions that keep me excited about the ways learning shapes into unexpected student explorations of what we don’t have the courage to explore sometimes. I am totally motivated to keep finding the perfect answer to this question in the upcoming units of inquiry. The good thing about it is that I know it will take a while and it will keep me for sure out of my comfort zone. The zone where my students own their learning and they are connected.